Congratulations to Rob, winner of this weekend's all new Person-of-Mystery Contest! He correctly deduced that the man in question was Ub Iwerks, an early Walt Disney animator and the creator of Mickey Mouse. Ub was born as Ubbe Iwwerks in Kansas City, Missouri, and was probably Walt Disney's earliest animator friend, meeting in 1919 when Walt was hired at the Pesmen-Rubin Commerical Art Studio where Ub worked in Kanas City. The next year the two started their first venture, Iwerks-Disney Commercial Artists. 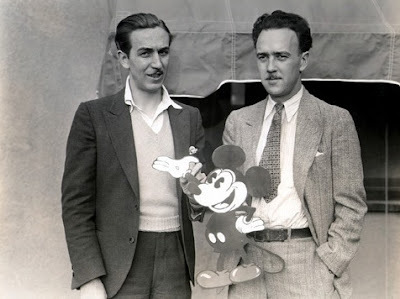 Iwerks-Disney was dissolved when Disney went to go work for the Kansas City Film Ad Company, but their friendship was revived when Disney convinced the company to hire Iwerks. Iwerks was the quiet and serious friend to Disney's outgoing and extroverted personality, but the two remained fast friends. Disney would start several companies and bring Iwerks along on each venture. Eventually, Iwerks was convinced by Disney to join him out in California, where he had started Disney Brothers Productions. Walt was the businessman and dreamer and Ub was the productive illustrator. When looking for new characters, Ub created the mouse who would later be known as Mickey. Walt would come up with the story ideas and Ub would animate them and finally Walt would do the voiceovers. 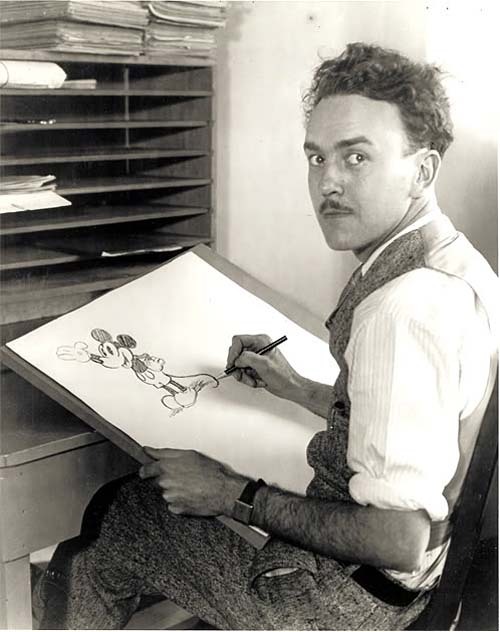 Iwerks was also training new animators for Disney to help him keep up with the volume of work. 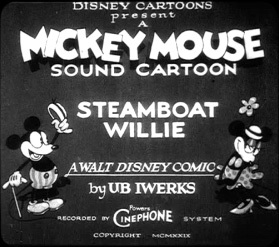 Their first big hit came in Steamboat Willie, but shortly thereafter, Disney became more demanding and Iwerks started believing that he was being overworked and under appreciated. 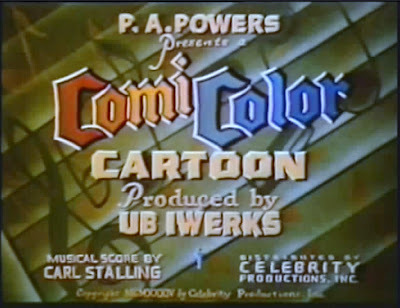 Iwerks took a job with Pat Powers, a man who had withheld money from Disney, and the friendship between the two was damaged. 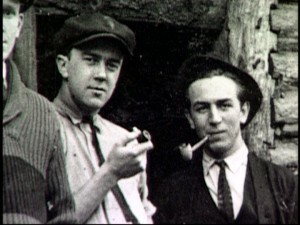 Disney bought out Iwerks 20% ownership in Disney Brothers in 1930 and the two moved apart. Powers bankrolled the Iwerks Studio, but the animators that Ub had trained for Disney started to take over his former duties and the Iwerks Studio never achieved great success, despite such characters as Flip the Frog. 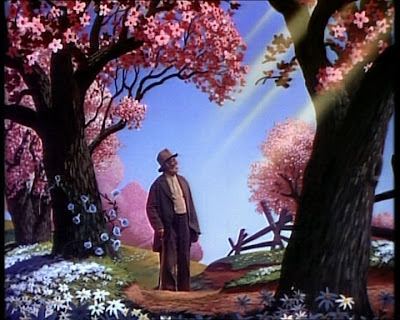 After animating a number of works and even creating some Looney Tunes for Leon Schlesinger, Iwerks returned to Disney Studios where he was most noted for creating the ability to combine live-action and animation as seen in Song of the South. What a name - I had to look it up. It's Frisian. Unsolicited suggestion: Consider keeping same game as before but modifying the rules - guessers are on their honor to not use Google or TinEye or such to make their guess. No cash is at stake, right? In case someone (besides me) is not always honorable consider recognizing same person as winner only once (twice?) every month or so. Maybe consider making guesses viewable by you (Nate) only, if possible, till you get a chance to check it out. Goals: Keep the game and don't overload Nate with work. "Comicolor - The Brementown Musicians"
One of my favorite cartoons; takes about 8 and a half minutes to watch. Hope 2 comments are OK! Ah....Song of the South. 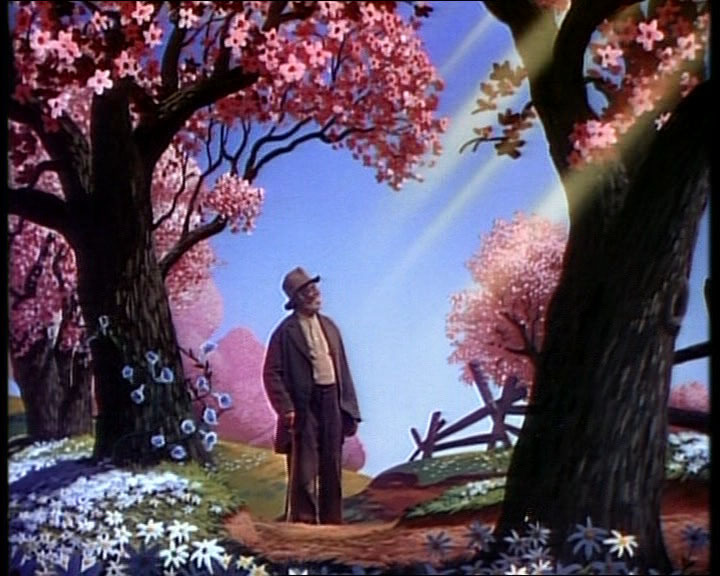 I love Uncle Remus stories, but I guess Disney Studios is not remaking that movie. Not politically correct?? I found a Canadian DVD of Song of the South & bought it Zippity-Do-Dah quick. I visit Disneyland often. (It really IS the happiest place on Earth!) I will have to keep an eye out for things related to this great man with an unusual name. The Steamboat Willie cartoon always plays at the Main Street theatre. Great story Nate. Anon, thanks for the link to the letter. It really adds a lot to the story.